It does appear that, unbeknownst to the "political wing," while its members were going about their respectable daily business, with absolutely no private army of their own, some of their colleagues were heading around the globe, committing massacres and terrorist attacks. This must be very embarrassing for them. Last Monday the EU bravely managed to ban what it terms the "military wing" of the terrorist group Hezbollah. It has not, of course, banned the "political wing." As noted here before, nobody in Iran, Lebanon or, come to that, Hezbollah itself, believes that such a distinction exists. The EU -- led by the unimpeachable rationale of the British Foreign Office, among others, has invented this pleasant and convenient little fiction. 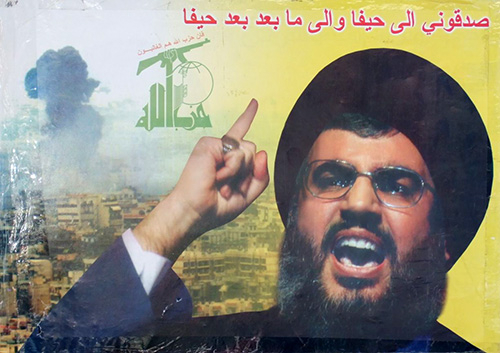 A Hezbollah poster featuring the group's leader, Hassan Nasrallah. Does the EU consider him Hezbollah's political, or military, leader? Last year in Burgas, Bulgaria, five Israeli tourists and one local Bulgarian bus-driver were murdered by a suicide bomber. The Bulgarian authorities subsequently identified Hezbollah as being behind this attack. Could the European Union let the European and other publics know what knowledge the "political wing" of Hezbollah had of this? Did their colleagues in the "military wing" not tell them about the attack? Or forget to send the memo? If the "military wing" did indeed go so wildly off-piste without any "political" direction, who was punished for this? Were there resignations, drummings-out or any other such activities? It can hardly be the case that nobody from the "military wing" boasted about it. After all, one of the Israeli victims was pregnant. If the EU cannot tell us that, perhaps it can tell us this: In 1983 a Hezbollah attack on a French military barracks in Lebanon killed 58 French peace-keeping soldiers. Can the EU please tell us if it has any information whether the "political wing" of Hezbollah had any knowledge of, or involvement in, this attack? Or was it just one of those communication breakdowns so familiar to everyone who works in an office -- you know, when no one knows what anyone else is doing? Furthermore, earlier this year, in March, a court in Cyprus convicted and imprisoned a Hezbollah operative who was found to have been scouting the island finding out information on Israeli tourists. Unless Hossam Taleb Yaccoub was a plane-and-bus spotter with some innocent if unquenchable interest in Israeli planes and buses, it would seem -- as the court found -- that he was helping enable some future attack on what is, after all (in the non-Turkish-occupied part of Cyprus) European soil. Does the EU have any views as to whether Mr. Yaccoub's activities were known to any members of the "political wing" of Hezbollah? Or was it another of those FBI / CIA types of cases where lots of people want to claim the credit and various agencies end up not speaking to each other? It must have been an awful shock for those working in the offices of the "political wing" when Mr. Yaccoub was arrested. After all, it is so out of character for the organization. Some of those "political wing" office staff must have seriously wondered about their loyalty to the organization when they found out how different the various wings' activities and concerns actually are. It is also urgent that the EU alert the "political wing" of Hezbollah to a truly disturbing story emerging in Syria. It seems to be the case -- according to multiple witnesses on the ground -- that the "military wing" of Hezbollah is engaged in military activities inside Syria. This will doubtless come as a terrible shock to Hezbollah's ivory-tower politicos. But it seems that many thousands of their colleagues might be involved. Their actions include shooting, blowing up and otherwise targeting those who are guilty of not being pro-Bashar al-Assad. If the Hezbollah "political wing" is unaware of this, then the EU must bring the matter to their attention. After all, it is a most disgraceful way to divert what must be limited funds during a period of global economic downturn. 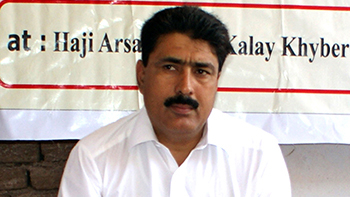 If the naughty "military wing" had not diverted its money into buying guns, bullets, rocket-propelled grenades and the like, then the "political wing" could almost certainly have used the money to pay for some new posters, flyers or some television attack-ads. As any fair-minded observer would agree, it must be a most difficult situation that the "political wing" of Hezbollah now finds itself in: after all, nobody likes to be made to look a fool, but unfortunately that is exactly what the "political wing" of Hezbollah is beginning to look like. For it does appear that, unbeknownst to the "political wing," while its members were going about their respectable daily business, with absolutely no private army of their own, some of their colleagues were heading around the globe, committing massacres and terrorist attacks. This must be very embarrassing for them. But fortunately, help is at hand. For now that the EU has banned one "wing" of Hezbollah and not the other, the EU can ensure that the appropriate funds go only to the respectable "political" wing of the organization. With its remarkable ability to keep an eye on any and all financial matters -- a track record only strengthened since the collapse of the Eurozone -- the EU can be relied upon to do for Hezbollah what it cannot do for its own books, and forensically account for every penny heading to and from the group's headquarters. So Hezbollah are going to have to watch out. The EU will be watching them closely. And it will know every step of the way where they are putting their money. If any of it looks as if it's going into the wrong office in the building, the EU will be onto them. Of course it might just go to the Secretary General himself, who happens to be the head of both the "political" and "military" wings of Hezbollah. But the EU will doubtless keep a watchful eye on him, too. If Hassan Nasrallah puts the loot into his right pocket, that will be fine. But if he puts it into his left pocket, he could be in serious trouble. The EU has invented an extraordinary policy. How interesting it is going to be watching them try to live with it.